I had high hopes for this bakery in the Richmond District, especially after discovering B. Patisserie (see post HERE) recently. This bakery/cafe serves a little bit of everything - quiche, pastries, sandwiches, and even has beer on tap. Normally when I think of a cafe or bakery, I think of a sunny atmosphere, but inside its very dark and gives an almost romantic aura, which the total opposite of what I expect at brunch. 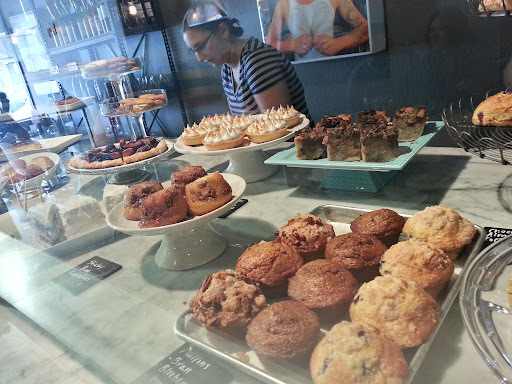 The bakery items look delish with constant refilling from the back. The salted caramel brown (left) was teeny tiny. The bite sized sweet didn't have much salt or chocolate flavor. I've only had a couple bombolinis before this one, but the nutella bombolini (right) tasted heavy and dense. 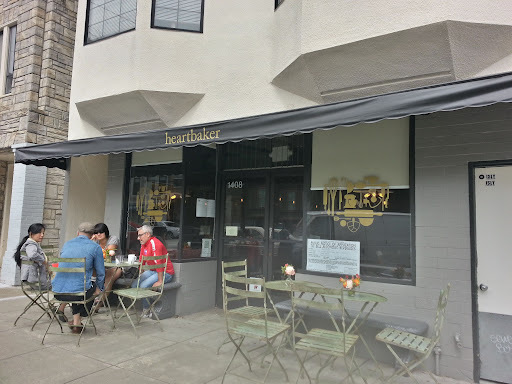 If I hadn't read about Heartbaker's brunch offerings beforehand I would never have guessed they served sandwiches. You have to ask the cashier for a menu of sandwiches, to which they hand over a clipboard of both brunch and dinner items. Admittedly none of the sandwiches on the menu seemed very enticing so I had to go with the brie and fig (I added proscuitto), even though I've never been a huge fan of fig items. The brie came out nice and gooey with slices of fig on top. Not bad and definitely the better of the two savory items. I did like the kale salad, which seems to come with all the savory dishes. Nothing special about this dish. A puff pastry filled with cheese. Its totally forgettable that I actually forget what was inside besides the cheese.